As a Mayo Clinic physician, healthy routines were part of Cathy Madaffari's daily life. 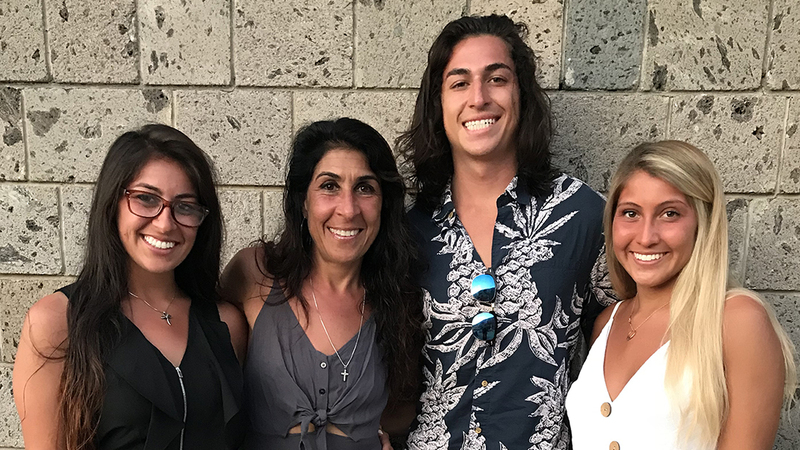 Yet in 2015, the former marathoner and mom of three found herself in a surprising role reversal when, instead of being a doctor talking a patient through a tough diagnosis, she was the one facing cancer. She was recovering from a cold when the cough started. But Catherine Madaffari, M.D., was the picture of health. As a physician in Community Internal Medicine at Mayo Clinic's Florida campus, she ate well, never smoked and exercised regularly. "It was just a dull cough that was lingering," Cathy says. "Honestly I didn't really notice it, but my colleagues did." At her co-workers' urging, Cathy had a chest X-ray. "There was a nodule on the X-ray. I knew what it was, and I was shocked," Cathy says. "Other than this cough, I was a healthy person with no family history. And not being a smoker or having any other risk factors, a diagnosis of adenocarcinoma of the lung was not something I ever thought I'd hear." It's a common misconception that you have to be a smoker to get lung cancer, Cathy says. "Really, anyone with lungs can get lung cancer," she adds. According to the American Lung Association, every 2½ minutes someone in the U.S. is told they have lung cancer. An estimated 234,030 new cases of lung cancer are expected to be diagnosed in 2018. It remains the leading cause of cancer deaths in men and women. "The surprising fact that many people don't know is that 20 percent of the people, if not more, that develop lung cancer are nonsmokers," says Cathy. And women are twice as likely as men to get the disease. Cathy acknowledges she was lucky. "Because of the astuteness of my Mayo Clinic colleagues, I was diagnosed at an early stage and am now a three-year cancer survivor. Most patients with lung cancer go undiagnosed until it's in stage 3 or 4, and then it may have metastasized," she says. "The surprising fact that many people don't know is that 20 percent of the people, if not more, that develop lung cancer are nonsmokers." Mathew Thomas, M.B.B.S., M.D., a Mayo Clinic cardiothoracic surgeon, performed a surgery known as a posterior segmentectomy to remove part of the right upper lobe of Cathy's lung that contained the tumor. Since her cancer was found early, Cathy didn't require the chemotherapy or radiation therapy that many people with lung cancer often require. "Being a physician and then becoming a patient, that was difficult at times," Cathy says. "Sometimes we assume that since the person is in the medical profession that they know exactly what is happening, what the next step is and what we need to do." Cathy applauds her colleagues for "talking to me and treating me as a patient. Everyone was just so reassuring that I knew everything was going to be OK. My biggest concern was my kids." At the time of her diagnosis, Cathy's children were 16, 17 and 21. "It was just the four of us. And I remember thinking, 'OK, I've got to tell my kids and reassure them,'" she says. "That was probably the hardest part because a diagnosis of any kind of cancer affects not just the patient but the whole family." Despite her worries, Cathy says her children remained positive. They, along with supportive colleagues, helped her navigate this tough time in her life. "Everyone was absolutely fantastic," Cathy says. "Very nurturing and reassuring. They made it so much easier." One of Cathy's children nominated her to be a Lung Force Hero — a program of the American Lung Association that aims to focus on women, lung health and their risk for lung cancer. "I'm fortunate that I'm here. I was diagnosed early. That doesn't happen often enough," says Cathy, who now balances her career as a physician with being a cancer advocate. In March, Cathy traveled to Washington, D.C. with Lung Force Heroes from around the country to testify before Congress about lung cancer's startling statistics. "We asked Congress to support increased funding for the National Institutes of Health for better treatment and early detection of lung cancer." "We have to educate people to get better at recognizing the symptoms that often go unnoticed or ignored, and to get screened," she says. "We asked Congress to support increased funding for the National Institutes of Health for better treatment and early detection of lung cancer." In addition, Cathy is eager for more research, particularly related to women, as the incidence of lung cancer continues to rise. "I want to see more studying being done on women, especially those that have no risk factors," she says. "Is it genetic? Is it environmental?" While high risk-patients, like current or former smokers, may qualify for a screening CT scan, Cathy hopes that one day there will be a screening test to diagnose lung cancer sooner. In the meantime, she reminds all those who will listen that "anyone is at risk for lung cancer." Talk with others who are dealing with lung cancer on Mayo Clinic Connect.